One thing I really have to admit about Japanese cuisine is that it is not just about great food, it is an art – the presentation is amazing, so very beautiful! Stunning! I think a lot of it has to do with the taboo of mixing food together. You’ll never see them do it like us with chap fan. They separate all the different tasting food, either by containers or by the fake green plastic things. They believe rice should be rice and stuff should be stuff and never shall the two mix (except in curry rice). We had a kaiseki dinner the first day, and every small bowl/plate/serving receptacle was arranged nicely and properly. Each item inside had thought to it and everything from the pace to the items was dictated carefully e.g. sashimi to steamed to fried. It’s amazing! They really respect food and the process. I like what your partner chose, yums! I would have gone with the fish too but I was attracted by the 9 box bento. 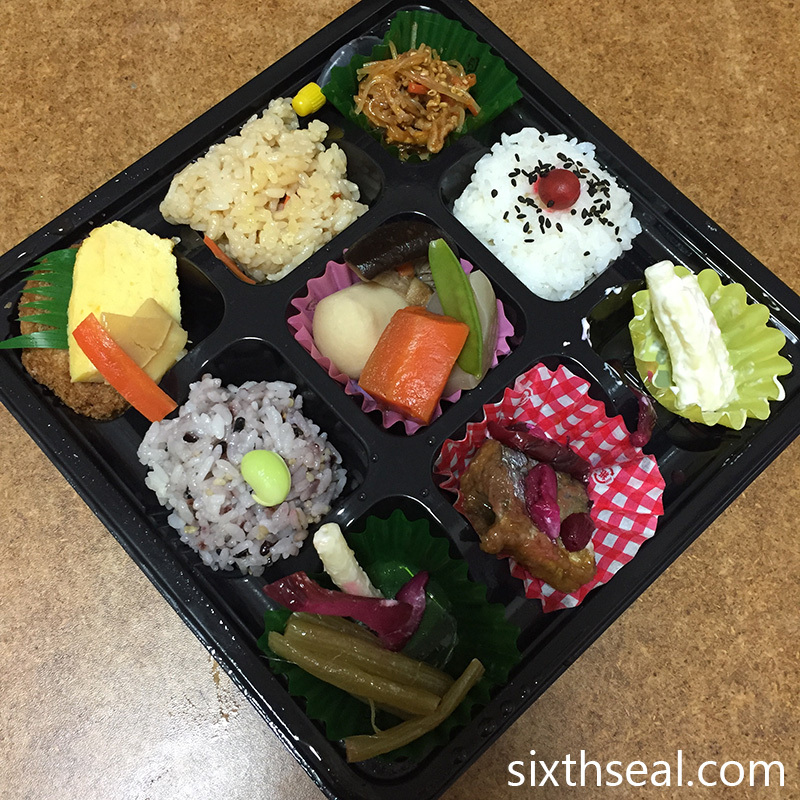 It had 9 different small compartments, 3 of rice, all different types (white, soy and grains) and 6 of sides. It looked great and tasted just as good as it looked. I have bought a bento in the Kyoto train station to eat on the shinkansen. It is a beautiful box. I am salivating as I look at both your delicious bento. 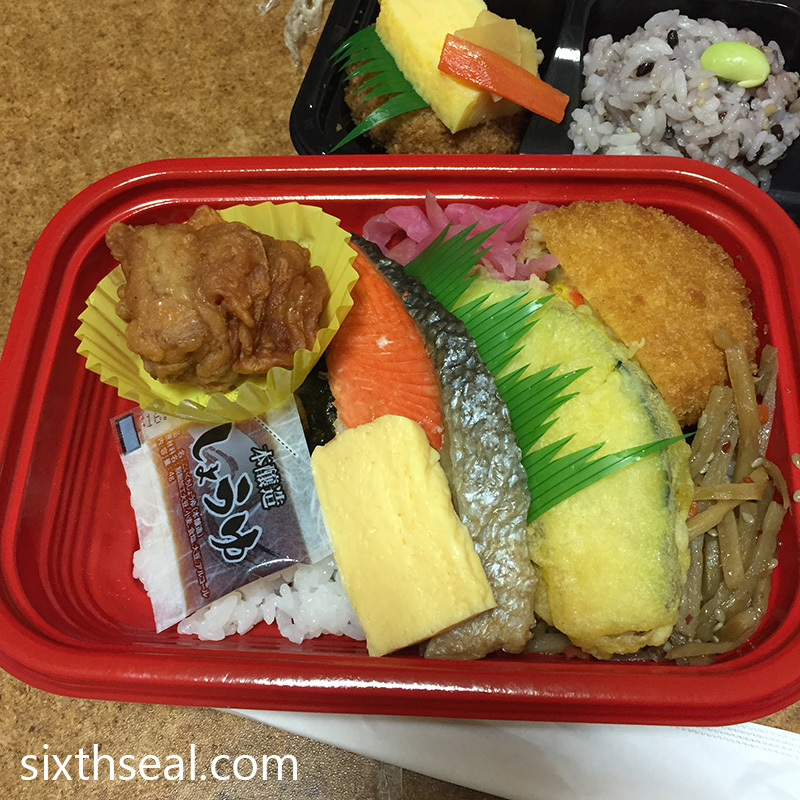 Ekiben are different from regular bentos. They’re made specially for train/shinkansen travel and comes in a sturdier box, usually lacquer or something that looks like it. 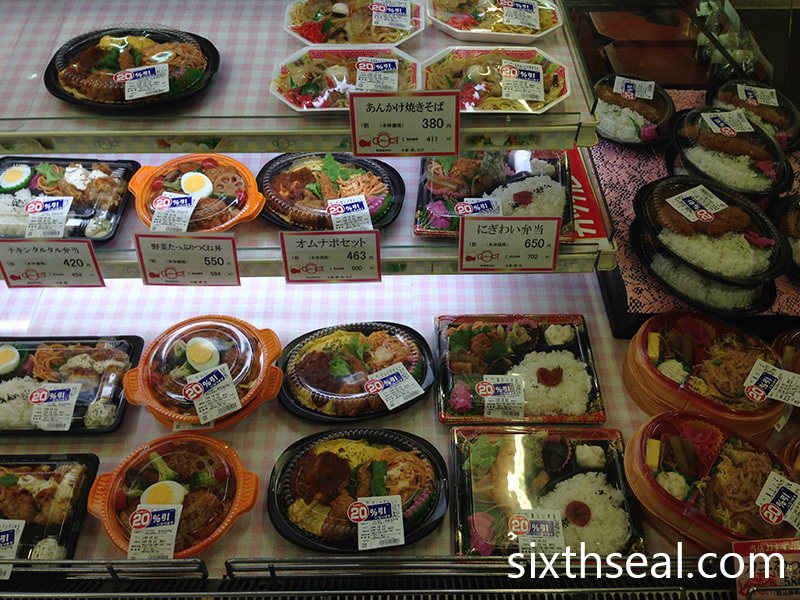 It also usually features food from the place/station e.g. in Otaru, my ekiben was full of uni (OMG!!!!) and ikura (salmon roe) coz Otaru is famous for that. It was so delicious, best 1,580 yen I ever spent. RM 65 may be quite a lot to spend on a bento but it was an ekiben and that’s usually more expensive. And it was soooo delicious. On my way hone, in June, I connect through Narita. I’ll try to get one of these to take to my daughter-she’ll love it. I’m not sure if you’ll be able to fly long distance with it though, they generally require refrigeration. Another good souvenir is Kit Kats (surprisingly). Japan has a lot of limited edition and region-specific ones that Kit Kat lovers (like myself) can’t wait to collect and eat. This was my work day lunch for 2 years! There’s a lady who comes in to our office daily and sells each bento box for 500 yen. Speaking of the God of Discounts, there’s a supermarket near my place last time that sold their sushi at HALF PRICE around 7-8pm daily. All the neighbourhood aunties will be there waiting for the worker to paste the sticker. The moment the sticker is pasted, the box is snatched! These aunties have really deft hands. My most expensive one was 1,580 yen for an ekiben in Otaru. It’s the ones you buy before you board a long train or shinkansen. It’s the Otaru special with uni, ikura and egg and it was the most delicious thing I’ve ever had the pleasure of eating. I really wish that I could eat it again. I wouldn’t mind eating it every day! That’s awesome! 50% off is quite a lot. Unfortunately, we couldn’t stay very long at Sapporo Factory so this was just the first round of discounts at about 4 pm. I’m sure people can’t wait to get their hands on the freshly discounted bentos, though I’ve never witnessed it myself, it was the central plot line for Ben-To. I’ll do it too if I were a student. You guys make me miss Japan a lot. I really wish and plan to go there again. Must save a lot if we consider to bring our kids along. 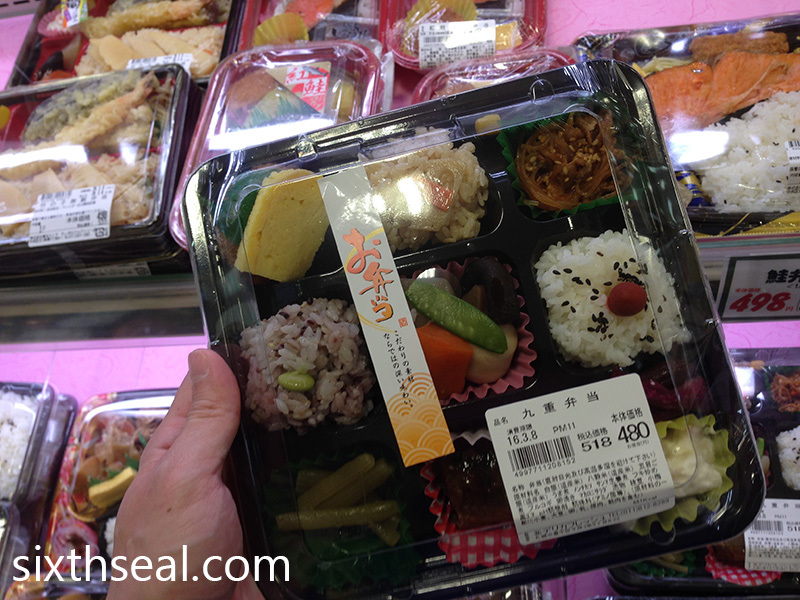 500YEN for a bento set is cheap. 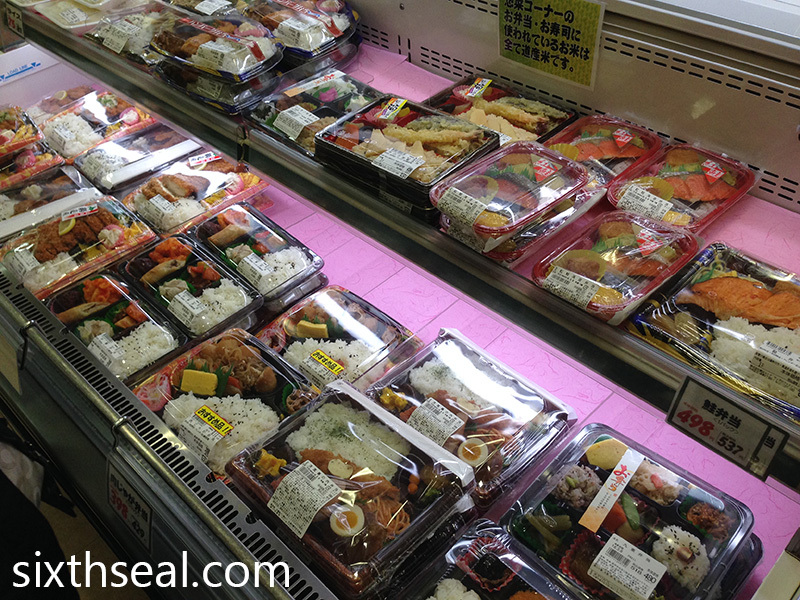 Someone told me that in different cities of Japan, the timing for discounts on the bento boxes would differ. My friend who used to work in Tokyo had the habit to buy after 7pm sharp when the price dropped. 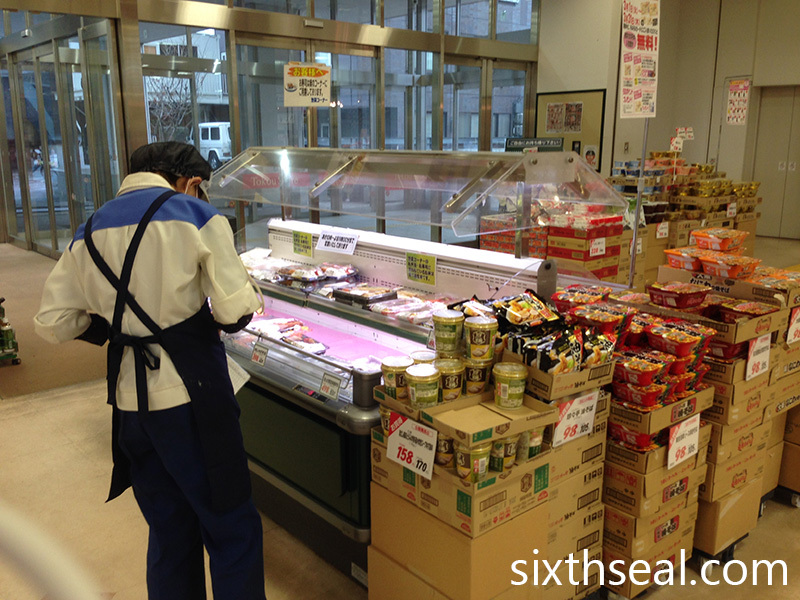 Weeks ago I was in Kyoto and waited like a vulture at the supermarket nearby my hotel. Oh God, the discounts only came after 8pm! By 9pm it was 50%. It made me so greedy.